You’ll be surprised to know that the godmother of Anthem of the Seas isn’t a celebrity! Instead Royal Caribbean have chosen a travel agent from the UK to be Godmother to one of the cruise lines most innovative cruise ships. The travel agent is 27-year-old Emma Wilby from Sunderland, UK. It’s a welcome change from the usual fanfare of celebrity Godmothers. 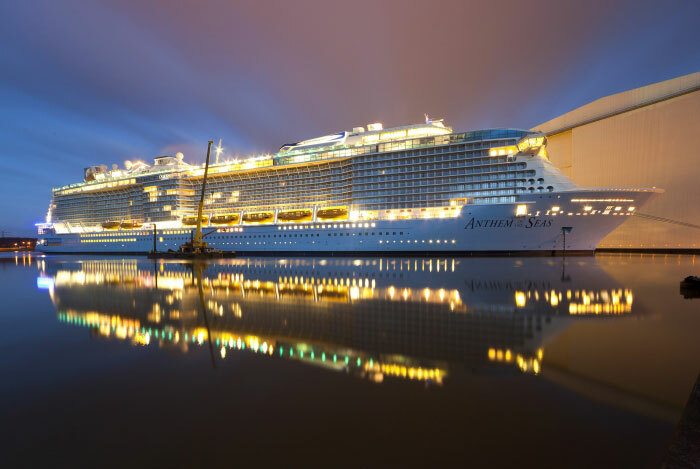 Ms. Wilby will officially christen Anthem of the Seas and perform a special song for more than 1,300 invited special guests and dignitaries at the ship’s inaugural ceremony in Southampton, U.K., on April 20, 2015. Designed to revolutionize the industry, Anthem of the Seas will sail its inaugural season from Southampton before the ship repositions to its permanent homeport of New York in November. In addition to being a travel agent for Thomson, Ms. Wilby is a military wife and budding singer who performs in the Military Wives Choir in Kinloss, Scotland, where she is based with her husband, a Royal Engineer for the British Army. To help her prepare for inaugural day, Craig Yates, Team Captain from British choir group Only Boys Aloud will be Ms. Wilby’s vocal coach, and Royal Caribbean is treating her to a full makeover. Anthem of the Seas is the second ship in the Quantum class and will have similar onboard features to sister ship Quantum of the Seas. The ship was built at the Meyer Werft shipyard in papenburg, Germany and is 168,666 gross tons.